Your data is a critical part of your business.Capture,Manage and Protect it with eFileCabinet. We are the authorized partner of eFileCabinet in Asia Pacific and Middle East. Document Management System is an application which can help you to archive, organize and retrieve all your documents in electronic format. It starts with capturing documents from host-based systems, Windows applications, and paper documents — including print stream data, fax images, HTML, PCL, PDF, and XML formats. You can organize all of these documents according to your specific retrieval needs using automated indexing tools. Once your documents are in the system, you can retrieve them using a wide range of standard search tools and searches tailored specifically for your users who retrieve documents over a LAN, WAN, company intranet, the Internet or directly from your ERP, CRM or accounting application. eFileCabinet delivers feature-rich, yet affordable electronic document management solutions that make it easy to scan paper documents, archive email and manage business-critical files in a secure database repository. No matter the industry, eFileCabinet products and services help businesses gain a competitive advantage by working more efficiently and collaboratively. eFileCabinet Online makes all of your documents and data available on a secure, cloud-based server. You can access your work from anywhere at any time, which means you never have to sacrifice on productivity, and you never have to worry about not having the right documents with you again. • New CloudView Backup: Get in-the-cloud backup benefit even as a desktop customer. This easy-to-use solution provides reliable system restoration from any catastrophic failure. Even when you’re off-site, you can safely access your backed-up files from anywhere. • Email Notifications for Workflow: Workflow has always helped users save many hours in document processing by automating in-house document processes. Now it also includes instant notifications to assigned parties via email. • Active Directory Syncing: Importing users and groups from a Windows domain has never been easier. This feature also provides and verifies user credentials and makes the IT team breathe easier. 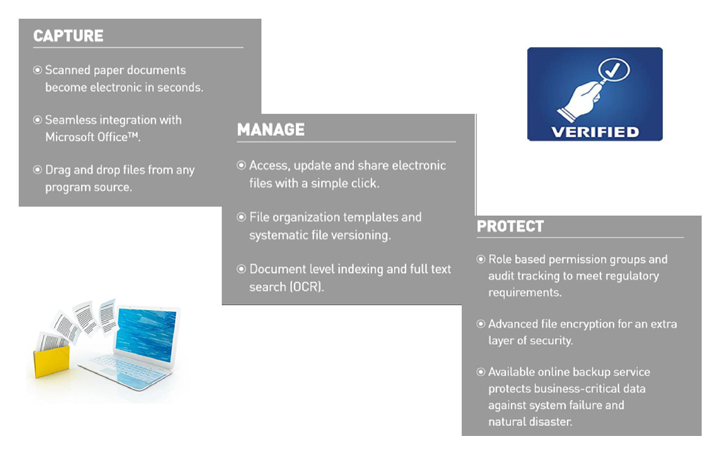 • Integration: Document management and e-recording meet at last! If your company uses Simplifile, this powerful add-on will help you easily transfer documents from eFileCabinet to the Simplifile website for review and processing. • CSV Profile Export: This new feature makes it simple to export eFileCabinet profile data into one easy-to-access file. • Mobile: Customers with a CloudView account will have access to our enhanced mobile app, which features an “at-a-glance- view of your most important information. in seconds, you can access today’s items, a quick search feature, and more. • Zonal OCR: For easy management of scanned documents, Zonal OCR is a must! Scanned forms, such as Tax 1040’s, automatically convert to profile fields in eFileCabinet that are easily retrieved as metadata in a search. • ScanSnap: For quick storage of scanned documents, users will now have easy access to the new interface between eFileCabinet and Fujitsu’s ScanSnap scanners.